An adorable group of orphaned bear cubs are ready to greet guests at the Wildlife Conservation Society’s Bronx Zoo. The zoo announced the debut of the four furry friends -- three brown bear cubs and one young grizzly bear who were rescued in separate incidences in Alaska and Montana -- on Thursday. The bears are happy and healthy, having quickly adjusted to their New York digs, but they had a rough start in life. 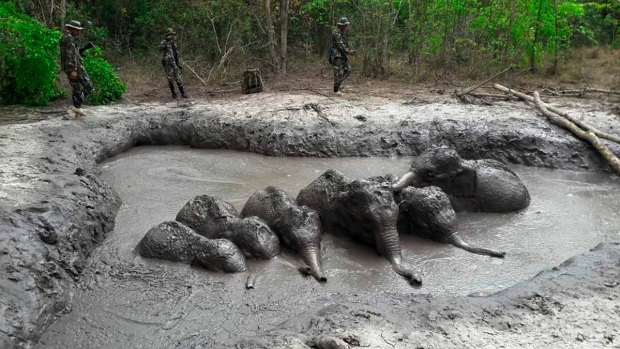 The mothers of all four were killed after wandering too close to humans. Jim Breheny, WCS Senior Vice President of Living Institutions and Director of the Bronx Zoo, says that the zoo is "happy to provide a home for these beautiful animals that would not have been able to survive in the wild without their mothers." Meet the gang of new bears. The three brown bears are siblings, born in early 2009 in southeastern Alaska. The largest male is named Kootz, which means "brown bear" in the Tlinget language. The smaller male is named Denali after the national park in Alaska, and the female’s namesake is Sitka, the fishing town where she and her brothers spent the month following their rescue. Glacier, the young male grizzly, is a year older than the Alaska bears and named for the national park in Montana where he was born. On Thursday, the zoo’s furry new friends, who are no strangers to cold weather, frolicked in the snow. Their tummies were full of apples, sweet potatoes, carrots, chicken parts and mackerel which form their daily commercial omnivore diet. They are also given honey for an enrichment treat and love to rip up bamboo stalks. Breheny said that the bears’ back story teaches people to look for ways to co-exist with nature. “Given that people are building homes inside prime bear habitat, it is unrealistic to expect those areas to be free of bears and that there won’t be encounters between people and bears,” he said. WCS conservationists work in the Adirondacks and the American West to educate the public on how to reduce human/bear conflicts. A WCS paper about bear and human coexistence outlines strategies for better relations between bears and people, which include educating people about keeping human food away from bears; enforcing requirements and laws; making land use decisions that will minimize interactions between people and bears.